Your loyalty bonus is paid to your poker account between the 1st and the 3rd of each month. Please note that The iPoker network is a no Rakeback network. However ChiliPoker provides its VIP’s with a monthly added cash bonus based on the FPPs that you are collecting! No percentage is available but will assure you; they will match or beat most of the top deals available today. Consult our promotions page for all the information about our VIP Club. This special VIP Offer does not deduct any bonuses, promotions, or other miscellaneous fees from your VIP rewards. 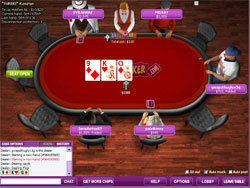 Chilipoker feels that they are one of the best alternatives for the iPoker (Playtech) network which they joined at the end of February 2007. According to them, customer care is their first priority and that Chilipoker is very well received by its customers. With a solid VIP cashback program and thie soon arriving VIP shop we feel that you should check this site out! Chilipoker is not the oldest iPoker room, but over the last few years at has grown into one of the biggest. Sporting an irresistible draw for players everywhere, the site is currently within the top 5 of the online poker industry. Its software is solid, its player base more than decent and its promotions are high-value, including numerous freerolls, live event satellites and leader board races. Even though iPoker players are not exactly known for how loose they are, Chilipoker’s player base includes quite a few casino players and sports bettors, thanks to which the overall quality of the Chilipoker competition is still juicy. At peak hours, there are around 10,000 cash game players at the poker room’s tables, together with about 55,000 at the tournament tables. Even though the game selection offered by the site is excellent (besides the ever-present Holdem, they offer Omaha, 5-card Stud and 7-Card Stud too) most of the player traffic is focused on the Holdem tables. Chilipoker’s software is the good-old battle tested iPoker software, well known by players all over the industry, kept fresh through continuous updates and tweaks. The software is solid, stable and it offers certain features one won’t find anywhere else. All the standard statistics-features are also available. The Chili Connect service is one of the unique features offered by the site. Through it, players can share their results with one another and they can even strike prop bets, thus adding an entirely new dimension to online poker. The site is home to some of online poker’s best known pros. It is the only online poker room where players can match skills with Liz Lieu. As far as promotions go, the most outstanding offer is the VIP ladder-based loyalty system which rewards players with ever higher bonuses and prizes as they work their way up the ladder. There are bad beat jackpots, SNG races, cash game challenges and large scale MTTs as well.